Why did you take part in Wake Up To Organic? It's a tradition for us and we couldn’t miss it! Most of our products are organic and having the opportunity of showcasing some of them during such a fun and well organised campaign like Wake Up To Organic is simply perfect for us. Happy customers and commuters! Plenty of people calling their colleagues to make sure they didn't miss out on a nice organic breakfast. Lots of smiles and compliments. Our staff also had the chance to talk more about organic farming, organic products and why these products are different. We do have very passionate colleagues who love spreading the organic message. What did you do on the day? 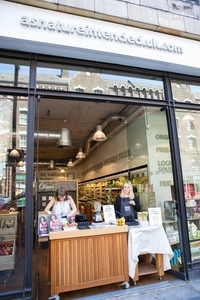 Each of our six London stores did something slightly different. They all prepared a lovely organic breakfast offering at least two options. 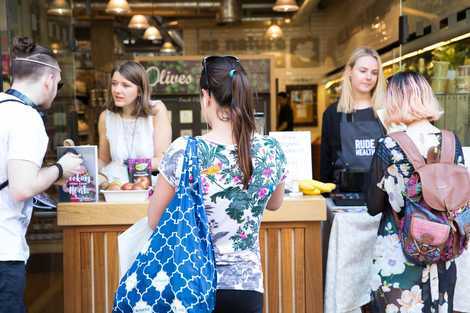 Then our Ealing, Marble Arch and Balham stores delighted commuters outside the local tube stations with a free organic breakfast item and a flyer that explained more about organic and encouraged people to enter our competition. 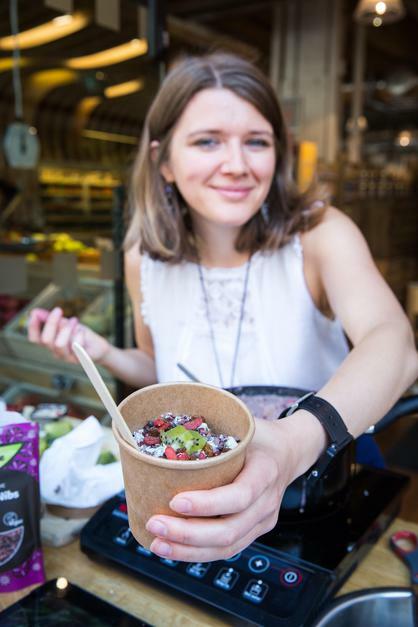 In Spitalfields, we had a Rude Health latte bar and blogger Denisa Ratulea cooking a delicious breakfast. 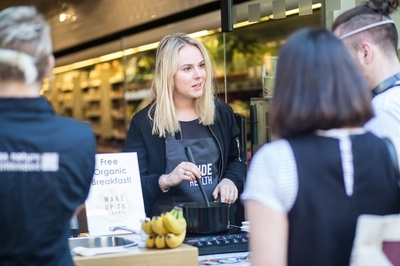 In Marble Arch, we hosted a Yoga & Organic breakfast on the Sunday before the actual event (due to limited space) and on the day an organic chef was cooking vegan, gluten-free, organic and utterly delicious pancakes (there was quite a queue!). Wake Up To Organic is always a success and feedback from customers are always positive. Plus our staff always put their heart into it and prepare really delicious (and generous) breakfasts. Our suppliers support with products to compliment the breakfast and/or to give away which helps in making more people happy. What was a highlight of the day? We had a huge hamper full of organic breakfast items which we used for an online competition. We had lots of entries for it and quite a few happy winners and runner-ups. Via social media and the flyer we gave to each person grabbing an organic item/breakfast in store.